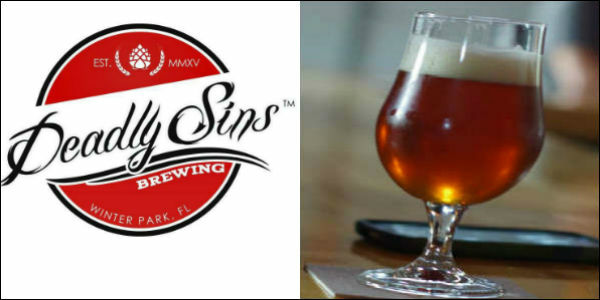 Central Florida’s craft beer scene will celebrate when Deadly Sins Brewing holds their grand opening event in Winter Park on October 15. The brewery’s journey began twelve months ago, when owners Tom Adams and Ana Barrientos were discussing their future. Tom had been homebrewing on and off for 15 years, a hobby that saw a renaissance when he met Ana. After a beautiful vacation in Asheville, NC the couple decided to take the next step, and open a brewery together. Within a month Tom had drafted a business plan, in three had secured a loan, and on November 1st, 2015 the lease was signed. The small brewery soft opened on July 15th but had difficulty keeping their own beer on tap due to a three-month delay in the arrival of their equipment. Brewmaster Travis Smith and Assistant Brewer Amanda Kucker have been crafting small batches in the meantime, but no longer as equipment arrived August 27. They now brew on a seven-barrel system, and released the first brew on the new system on September 23, 2016. Deadly Brewing’s Grand Opening party will start with a noon ribbon cutting, followed by opening 12 taps of craft beer, with limited releases scheduled to drop throughout the day. SwedeDISH and Daydream Pizza food trucks will be on hand, and there will be live local music until midnight. Deadly Sins Brewing is located at 750 Jackson Ave in Winter Park. The 4,000 square foot property is in an industrial area, off Fairbanks and behind 4Rivers Smokehouse. For more details, visit deadlysinsbrewing.com or Deadly Sins Brewing on Facebook.